Increasing attention is being given to outcomes of infants born at 34 to 36 weeks' gestation. Those born late preterm but healthy had cognitive and achievement scores through age 15 years that were not different from those born at term. Late-preterm children had no worse behavioral or emotional problems than full-term children and actually had fewer referrals for speech and language services. This study thus provides comforting information to parents and physicians alike in showing that any real disadvantages of healthy late-preterm children as they mature are minor, if they exist at all. 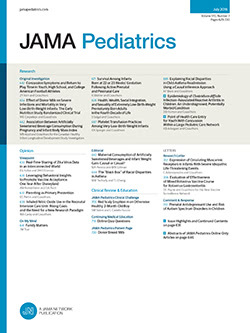 Estimated differences (late-preterm minus full-term children) in Woodcock-Johnson Psycho-educational Battery–Revised Letter-Word Identification measure across time. The Bucharest Early Intervention Project, the first randomized controlled study of foster vs institutional care, offered a unique opportunity to study growth within otherwise healthy institutionalized children with a known duration of social deprivation. Children younger than 32 months of age living in institutions for infants in Bucharest, Romania, were randomly assigned to remain within institutional care and receive care as usual or to a foster care group. Foster care had a significant effect on growth, particularly with early placement and high-quality care. Growth and IQ in low-birth-weight children are particularly vulnerable to social deprivation. Full-scale IQ at 54 months by age of randomization and birth weight in children randomized to foster care. *P < .001 vs children with a 2.5-kg or heavier birth weight who were randomized at younger than 24 months of age. This study sought to examine the associations between childhood hardship and reproductive outcomes in a longitudinal study. Using a nationally representative sample of births in Great Britain in 1958, Harville and colleagues followed up 4865 girls to age 14 years. Hardships during childhood such as parental unemployment, poverty, and family dysfunction increased the risk of later delivering a low-birth-weight or preterm infant. There was a dose-response relationship between the number of hardships and the risk of these outcomes in part due to an association with smoking during pregnancy and lower socioeconomic status as an adult. Greater number of exposures in adolescence or childhood/adolescence had a stronger impact on outcomes than exposure in childhood alone. There is a growing appreciation of the effect of child maltreatment on the health of children both during childhood and later into adulthood. Among children in the Fragile Families and Child Well-being Study, those whose mother reported chronic intimate partner violence (IPV) were 80% more likely to be obese at age 5 years than those with no maternal IPV. This risk was higher for girls than boys and children growing up in neighborhoods that their mothers considered unsafe. Interventions to prevent IPV, particularly those aimed at educating adolescents about healthy relationships prior to childbearing, may play a crucial role in prevention of early childhood obesity.